When my oldest daughter, Casey, was getting ready to be baptized in the fall of 2003, my family and I had the opportunity to attend a picnic luncheon for LDS Humanitarian Center employees as an expression of gratitude from the Sr. management for all of our hard work we had done for the year. I remember that it had been a pretty rough year for natural disasters around the world, which had kept us pretty busy sending out Hygiene kits, Neonatal resuscitation kits for newborns, School kits and other humanitarian aid. There was an enormous earthquake in Algeria that required much assistance, as well as a devastating heat wave in France that had attributed to thousands of deaths and crippled the country at the time. Although the desire to be baptized is one thing, it is another to fully understand the commitment involved and the covenant we make at baptism. When it comes to gospel principles, I have always used the “crawl, walk, run” methodology of teaching that I learned from my own parents, who learned it from their parents. For example, taking your children to see their friends and neighbors get baptized into The Church of Jesus Christ of Latter-day Saints is a wonderful teaching opportunity. It generates gospel oriented questions from them and offers a perfect time for parents to conduct personal interviews with their children to address those questions. It also is a good opportunity to teach them by the Spirit in their own language and understanding. Many times, prior to my own children’s baptism, they would ask, almost nervously, “why is baptism important, Daddy?” Or, perhaps fearing the worst, “…you won’t let me drown, will you Daddy? I’m scared to go under the water.” After some brief explanations, my children would insightfully ask “why did the Savior need to be baptized?” and “why do we need to follow the Savior’s example?” In order to answer these questions correctly, we need to understand the ordinance of baptism, what baptism is, why it is so important, what we do after we make the covenant of baptism, and how it can help us achieve a spiritual rebirth which results in true discipleship. For each of us, starting on the road towards exaltation and eternal life with our Father in Heaven begins with faith, repentance, and then ultimately baptism (Articles of Faith 4[i]). These three steps, combined with the ordinance of baptism, are the first steps and the first saving ordinance that we must do to return and live with Him. Our Savior understood this, so He was baptized to show us the “the straitness of the path, and the narrowness of the gate, by which [we] should enter” (2 Ne. 31:9). “Notwithstanding he being holy, he showeth unto the children of men that, according to the flesh he humbleth himself before the Father, and witnesseth unto the Father that he would be obedient unto him in keeping his commandments” (2 Ne. 31:7). Because He was a perfect example to each of us, and because He was obedient to His Father in Heaven, is there any question why He began His ministering in the same way? And when Jesus had been baptized, just as he came up from the water, suddenly the heavens were opened to him and he saw the Spirit of God descending like a dove and alighting on him. And a voice from heaven said, "This is my Son, the Beloved, with whom I am well pleased." Go ye therefore, and teach all nations, baptizing them in the name of the Father, and of the Son, and of the Holy Ghost: Teaching them to observe all things whatsoever I have commanded you: and, lo, I am with you always, even unto the end of the world. Amen. (Matthew 28:19-20, emphasis added). From these scriptures we learn that baptism is very important to our Savior Jesus Christ, which means that it should be just as important for all of His followers today. If we want to become like our Savior, then we should take part in baptism. It is part of our Father in Heavens plan of happiness for us. If we do not understand covenants we cannot understand, in full, the issue of baptism, because baptism is a covenant ordinance. As mentioned earlier, it is so important, that even our Savior, Jesus Christ participated in this sacred ordinance. President Spencer W. Kimball (1895-1985) taught that: “To be baptized is to enter into a covenant [with God] … to do, not merely to refrain from doing,…[ii]”. President Kimball goes on later to say that our covenant of baptism is also “…to work righteousness as well as to avoid evil”[iii]. We will discuss how the covenant of baptism can help and motivate us to avoid evil later on in this book. 5. Will always be a witness for Jesus Christ and His Church. 4. Give us Eternal Life, the greatest of all of God’s gifts to his children (D&C 14: 7). The Lord uses symbols to help us understand eternal truths. The ordinance of baptism is particularly rich with symbolism, and it would be to our benefit to reflect and ponder upon its meaning, and the more we do so, the more these symbols (especially with baptism) will begin to make sense to us. Elder Russell M. Nelson of the Quorum of the Twelve Apostles explains that “…we are taught in the Masters way. His way differs from modes of others. His way is ancient and rich with symbolism. We can learn much by pondering the reality for which each [baptismal] symbol stands”[iv]. We know that baptism is an outward testimony of what has occurred inwardly in a believer’s life. Additionally, baptism illustrates a future member’s identification with Jesus Christ’s death, burial, and resurrection. Symbols bring color and strength to language, while deepening and enriching our understandings. Even Adam, our first parent, needed help in understanding the symbolism of sacrifice (Moses 5:7), so we too may need help in understanding the “ancient and rich” method the Lord uses with regards to baptism. Symbolically speaking, going under the water represents dying and being buried with Christ. The action of coming out of the water represents Christ’s resurrection over death, and our willingness to accept Him into our life by terminating our “old life,” or cleansing and washing it away in favor of a “new life” that the Savior has promised us to those who accept Him. Baptism also represents the individual’s commitment to a life in Christ, being born of God, thus born again of the water and of the Spirit (See Rom. 6: 3-6; Mosiah 18: 13-14; Moses 6: 59-60; and D&C 128: 12-13). It is a step towards complete obedience—publicly declaring faith in Jesus Christ and a commitment to Him. It clearly states from the Book of Mormon that our baptism is a covenant to “…stand as witnesses of God [and His kingdom] at all times and in all things, and in all places that ye may be in, even until death, that ye may be redeemed of God, and be numbered with those of the first resurrection, that ye may have eternal life” (Mosiah 18:9; emphasis added). As wonderful and fulfilling as baptism is, we need to understand that it is not a “free ticket” into the Celestial Kingdom of our Father in Heaven. This doesn't mean that we'll never sin again, because sin has a way of coming back to life, but it does mean, like Paul said, that we should no longer be slaves to sin (see Romans 7:14). We certainly know and understand that we will all sin again and that “…no unclean thing can enter into his kingdom; therefore nothing entereth into his rest save it be those who have washed their garments in my blood, because of their faith, and repentance of all their sins, and their faithfulness unto the end” (3 Nephi 27: 19). After Baptism, we should make every effort to insure that sin no longer dominates or controls our lives as we strive to "be holy even as He is holy" (see 1 Peter 1:15-16). “…baptism and confirmation is not the end goal. It is the missionaries [and members] privilege and responsibility to teach investigators that there are additional covenants and ordinances that they may receive in the House of the Lord”[v]. “Each week in sacrament meeting we promise to remember the atoning sacrifice of our Savior as we renew our baptismal covenant. We promise to do as the Savior did—to be obedient to the Father and always keep His commandments. The blessing we receive in return is to always have His Spirit to be with us”[vi]. The ability to “yield” our hearts to God is no easy task and takes a lifetime of work and effort. However, we do know that our Father in Heaven has made it possible through the atonement, and that we should work out our salvation with “fear and trembling” (see Phil 2: 12), but I do want to point out, that many people fail to see what is written in the very next verse which says: “For it is God which worketh in you both to will and to do of his good pleasure” (Phil 2: 13). For if any be a hearer of the word, and not a doer, he is like unto a man beholding his natural face in a glass. As the scriptures indicate, it’s not enough to be just “hearers of the word, but doers also”. We must hear, and then go do. That’s the wonderful blessing of the Gospel of Jesus Christ. Being part of this Gospel, we must, by default, teach it to others whether it be by formal assignment or by example. Teaching of the Gospel powerfully convicts us and moves our hearts and wills into action. It also can reprove us at times, correct us, and instruct us further in what we need to do to be more like He is. As indicated earlier, if we don’t understand the reason we are baptized, if we lack the knowledge, it can’t motivate us to become better. It’s a lot like having a house wired for electricity, but not knowing how to turn on the lights or how to use the appliances powered by that electricity. "They [the missionaries] still have an obligation to nurture and help those they have baptized - to befriend them, to write to them, to give them encouragement. But greater than that is your responsibility, my brethren, as bishops, as stake presidents, as elders quorum presidents, to put your arms around these people and make them feel comfortable and at home and warm and happy. It is an imperative. 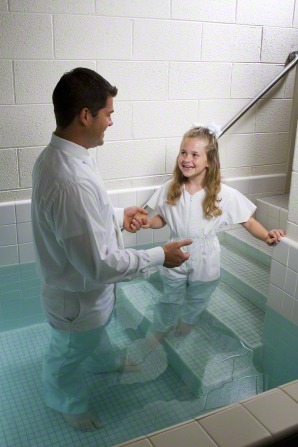 What does it profit the missionary to baptize someone who leaves the Church within six months? Nothing is accomplished, in fact, damage is done. We have pulled them away from their old moorings and brought them into the Church, only to have them drift away"[vii]. So it would seem that the power and potential to move to this deeper level of covenant keeping has been there all along, but the motivation to live it simply needs a “jump-start”. It breaks my heart when I hear of people that are so preoccupied by the “things of this world” that they are not necessarily in “transgression” for being that way, but certainly they can be in “diversion” which consequently can cause them to waste “the days of their probation” (see 2 Nephi 9: 27). Regardless, many of these people claim that they proudly live “without God in the world” (see Alma 41:11), with the gates and doors unfortunately locked from the inside! “As we finished the Christmas 2004 run of “Savior of the World”, I had opportunity to thank all my many friends and cast members and tell them how much I would miss them, and how forward I would look to seeing them again. One of the ladies I have gotten to know in costuming, a sweet, older lady named Susan (Suzy) said something to me that has caused me to think. As I was saying goodbye to her, my emotions came to the surface and some tears were shed. I recall that she was putting some clothing racks on the elevator with our costumes and after saying goodbye; she turned to me and said that this must be what it is like at the veil. I asked her what she meant by that, so she expounded. “We all have friends here in this cast that we will miss terribly.” She said. I agreed. What do these experiences from my own life teach me about the covenant and ordinance of baptism? It teaches me that I need to be in the world, but not of the world. It reminded me that I was to stand as a witness of God [and His kingdom] at all times and in all things and in all places (Mosiah 18: 9). Like baptism, being in these productions changed my life, and helped me and my family establish an allegiance to the kingdom of God. For me, when I think of my own baptism, or when I think of my part of portraying an Apostle of Jesus Christ in the LDS Church Conference Center production of Savior of the World, it helps me to remember whom I am serving, why I am serving Him, and the promises I have made to Him to do all I can to return and live with Him with my family and all the friends that I have made here that want the same thing I do. Oftentimes, we think of baptism as a once in a life-time event, which it is in the sense that it only takes place once in a members lifetime. However, the covenants that we make with baptism are for our entire lifespan. It is to be remembered and cherished each and every day of our lives. Because of this, the Sacrament should have much more meaning and significance than just taking bread and water each week. The Sacrament that we partake of is set up to help us remember those covenants that we made at baptism each and every week. As a result, the baptismal covenant can remain an active part of our daily life and spiritual progression long after the actual ordinance and will lead to much greater spiritual power in our individual lives. I feel such gratitude and appreciation for my Savior and my baptism into The Church of Jesus Christ of Latter-day Saints. I am grateful for the saving ordinance, covenant, symbolism, and motivator to a more committed lifestyle that baptism generates for me. I am thankful for goodly parents, siblings, and teachers which help me along my path. It is my prayer that we may ponder and reflect upon the sacred ordinance and covenant of baptism as the gateway into His kingdom, and that we may cherish the choice we make to be part of His kingdom. [i] According to the Latin Dictionary and Grammar Resources, Latdict, the English translation of the word “testamentum” or “testament” means: 1. A covenant and 2. A will, testament. [iv] “Personal Preparation for Temple Blessings,” Liahona, July 2001, pg. 38; Ensign, May 2001, pg. 33.